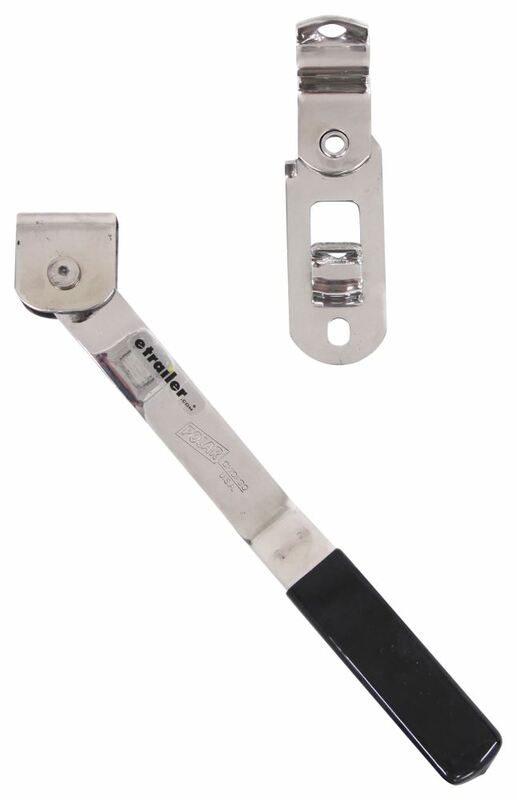 Stainless steel cam-action door latch is ideal for large, professional-use trailers and similar applications. Bushings and bearings prevent wear on moving parts. Double-action handle protects against in-transit jarring. 1" Pipe not included. Call 800-298-8924 to order Polar Hardware enclosed trailer parts part number PLR658-SSP or order online at etrailer.com. Free expert support on all Polar Hardware products. 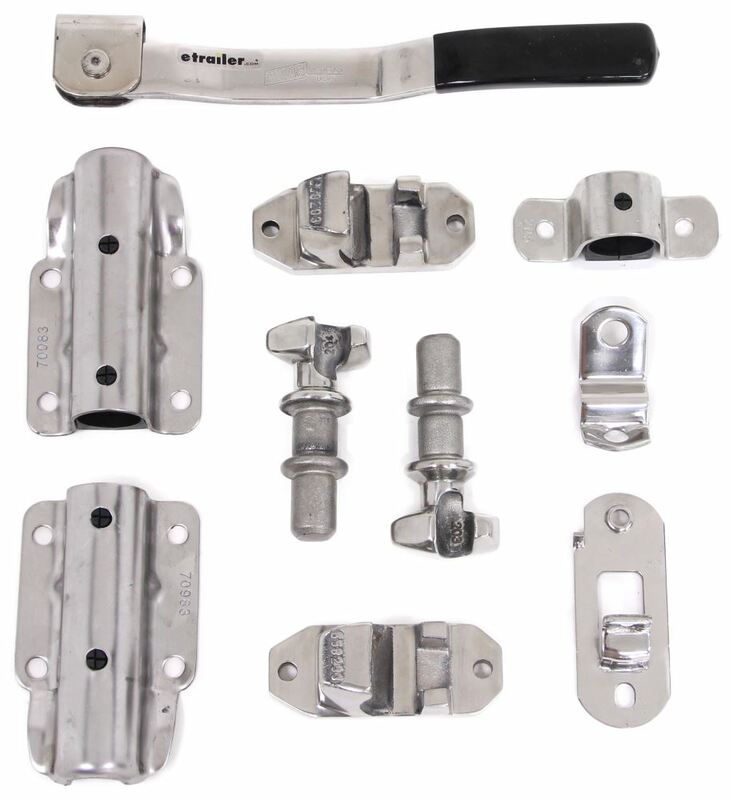 Guaranteed Lowest Price and Fastest Shipping for Cam-Action Lockable Door Latch Kit for Large Enclosed Trailers - Polished Stainless Steel. Enclosed Trailer Parts reviews from real customers. 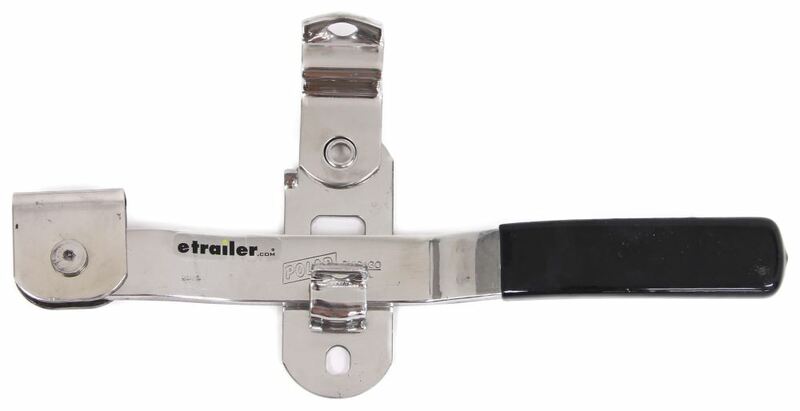 Stainless steel cam-action door latch is ideal for large, professional-use trailers and similar applications. 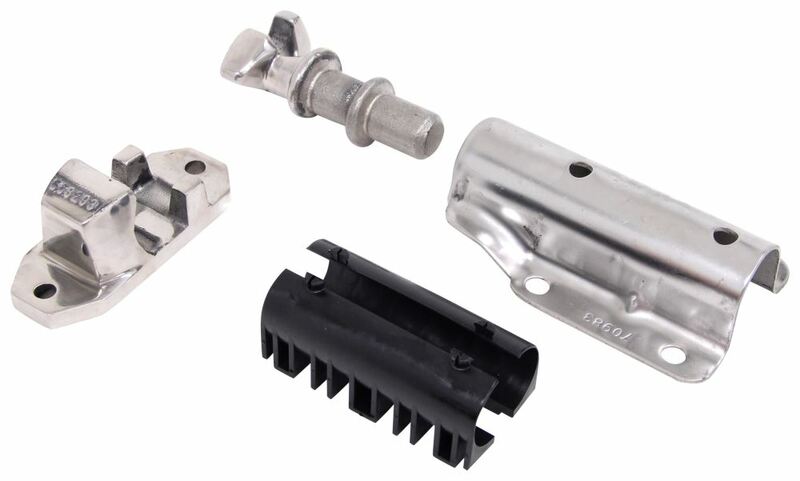 Bushings and bearings prevent wear on moving parts. Double-action handle protects against in-transit jarring. 1" Pipe not included. 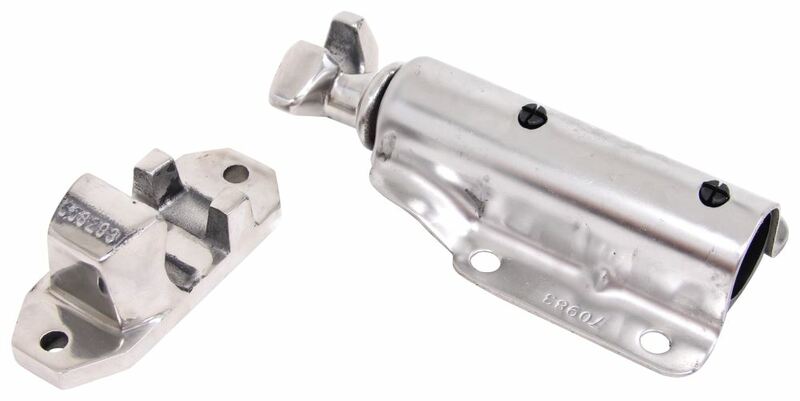 Today, we're going to take a look at the Polished Stainless Steel Cam-Action Lockable Door Latch Kit for large enclosed trailers. 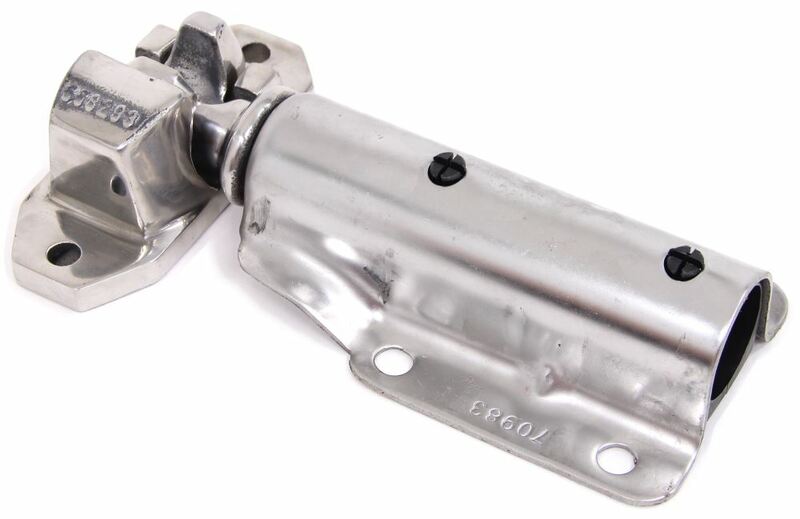 Now, this cam-action door latch is ideal for heavy duty side or rear doors on large trailers and trucks using commercial applications. It has this nice double action handle assembly here that ensures simple, secure latching. It helps protect against any in-transit jarring. Basically, you just flip the handle keeper on the hasp latch up, and then you just lift your handle to release. Rotate the handle to either release or engage the cams. If you notice on the handle, it's a nice black vinyl grip on it. Makes it very comfortable to grip and use.The hasp right here is a bridge type hasp. You can see as I turn it sideway, the bridge design to it helps prevent accidental opening and ensures safe latching action. Basically, when that handle slides back into the hasp and you turn that keeper, if you notice, the holes will line up and you can actually put a padlock through there for extra security. 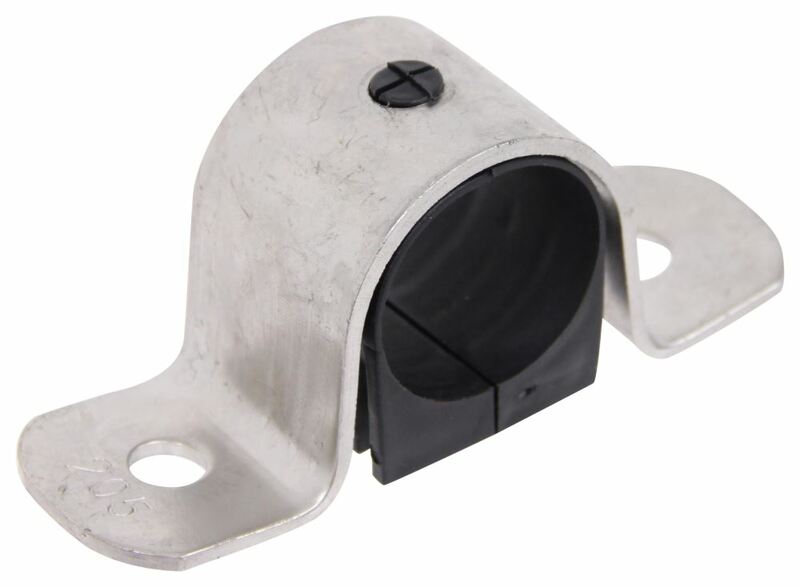 The padlocks we do sell separately on our website.Now, they do use split bushings right here in these retainer brackets. Let me see if I can pull one out and you can see these right here, these split bushings. These will help prevent the friction and rattle and reduce wear on any moving parts. They just line up with the retainer brackets and you just push them right into place.Now, all these parts are a nice stainless steel construction. It provides durability, super corrosion resistance. The polished finish on it, you can see, has a nice sleek look to it. Now, it does include everything laid out here on the table. The two universal keepers, one right up at the top here, one right at the bottom. 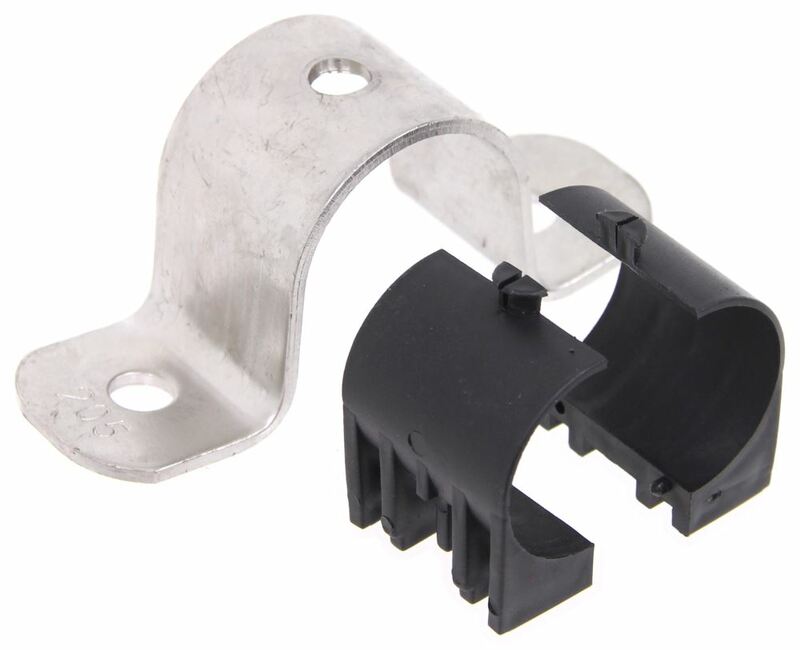 The top lug, which is this portion right here, and then the bottom lug has the two large pipe retainer brackets. And I showed you the split bushings on the inside, has one center pipe retainer bracket, with the small split bushings on the inside of that.Let's go ahead and put this back together. And then, it also includes your handle assembly and the bridge style hasp. All these parts are a nice simple bolt-on installation. Now, it does require a one-inch diameter standard pipe and hardware to install all these parts. Now, they are not that . Pipe and hardware is not included. And the handle length on this is going to be right at 14 inches.But that should do it for the review on the Polished Stainless Steel Cam-Action Lockable Door Latch Kit for the large enclosed trailers.